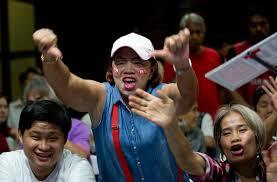 Military-backed party takes lead in Thailand elections – Royal Times of Nigeria. Preliminary results from Thailand’s Election Commission show a military-backed party ahead of the opposition, in the country’s first elections since a military coup in 2014. With about ninety percent of ballots in Sunday’s long-delayed polls counted, the Palang Pracharat party had seven million votes. Pheu Thai, the party linked to the former prime minister and exiled tycoon Thaksin Shinawatra, had six-point-six million. Future Forward, a newly founded party that campaigned on a promise of change and military reform, was third, with nearly four-point-eight million votes. The commission said it would announce the final results on Monday morning. The vote is taking place under a new constitution that gives the military considerable influence over the country’s civilian politics and makes it difficult for any party to win a majority in the 500-seat lower house. The upper house is appointed by the military. Prayuth Chan-ocha, the retired army general who led the coup against the country’s last elected government five years ago, hopes the election will return him to power as a civilian prime minister.